Many of us enjoy oysters with beer. Recently, the folks from the Massachusetts Oyster Project (MOP) held an event at the Mayflower Brewing Company for an afternoon of just that, oysters and beers. Rumor has it that the two groups will be getting together again in the future to repeat the event with more oysters. 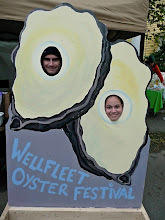 To stay up-to-date on events organized by the Massachusetts Oyster Project, follow them on Facebook or read the MOP blog online by clicking here. If you would like us to post news about your oyster related event, please send your stories (including any pictures, links and videos) to josh@goshuckanoyster.com for consideration. There is no fee for this service, we just love to spread the word about oyster happenings around the world.